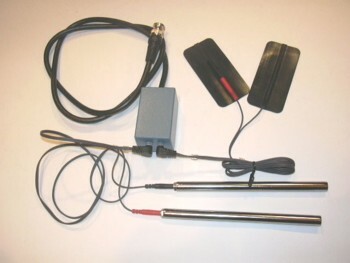 Simple adapter to plug (BNC) into standard laboratory frequency generators with two output TENS connectors (2.5 mm) for skin and hand electrodes. Volume control can be added in order to attenuate the signal down to zero. Amplifier can be added for driving magnetic coil, light and laser devices.